This home is a MUST SEE! Fabulous remodel and terrific LOCATION! 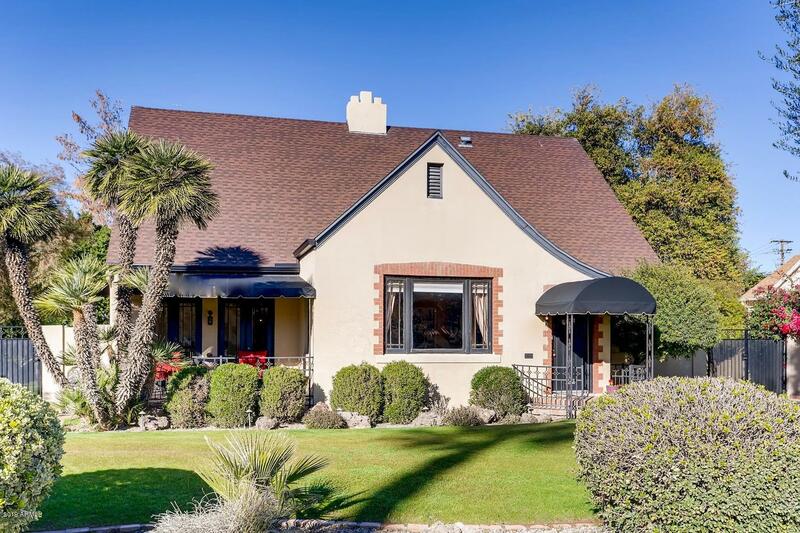 Beautiful & charming one-of-a-kind STORYBOOK TUDOR REVIVAL style home built in 1925 in the heart of the Alvarado Historic District, the finest historic district East of Central Avenue! Developed and platted by Dwight Heard between 1908-1929, Alvarado contains one of the largest concentrations of historic urban estate homes. This home is one of only 28 homes within this historic district, making this a rare opportunity to live in Alvarado. These homes rarely, if ever, come on the market. Current owners have made multiple much needed improvements to this home. Don't miss out on an opportunity to move into this exclusive enclave! This impeccably maintained home constructed of 8'' block and stucco with a classic gabled roof and architectural composition shingles, has stunning original 9-light prairie style wood windows and French doors throughout that bring in tons of natural light. The interior boasts gorgeous solid oak hardwood floors, wood paneled doors, and 13' high vaulted ceiling in the living room with an ornate grand gas fireplace with mantel, lovely leaded glass pocket doors, adorable telephone niche, original light sconces, ceiling fans, arched room openings and a large formal dining room. The kitchen has been tastefully remodeled with new cabinets, black honed granite countertops, large farm sink, lights, glass subway tiles and high-end commercial grade Viking appliances, while maintaining vintage charm by keeping the original built-in ironing board. The large master suite contains a newly added master bathroom along with walk-in closet & gorgeous French doors that lead out to the pool area. There is also a second master suite with bathroom. Currently 1 of 3 bedrooms is being used as a home office and has a new adjoining half bathroom. Home has a new main sewer line with several cleanouts and a new laundry room. This fantastic home sits on an oversized private lot with lush front and back yard landscaping with sprinkler system, mature fruit trees, large patio, sparkling deep diving pool, outdoor fire pit, block walls and wrought iron fence with new gates. You will also love the front terrace and large historic double car garage with long driveway that has plenty of parking for all of your entertaining needs. There is even a basement with plenty of storage space! In 2013, the home took part in the Energize Phoenix program. As a participant in the program, the home received a brand new 5 ton/16 seer HVAC system, attic insulation, ductwork sealing, sun screens on east/west windows and complete APS upgrades to include new electrical wiring and exterior lead paint removal. Don't miss out on an opportunity to live in this active and friendly neighborhood located within the Midtown Arts and Museum District, where you are only steps away from light rail, world renown museums, theatres, wine bars, coffee shops and more award winning restaurants than you can ever imagine. Easy freeway access makes this neighborhood the perfect choice for superb urban living. You're going to love this place and it's sure to sell quickly. Come view this gorgeous home today!